Thanks Million Gift Box printed words on $100 dollars bills open gift box. Will be delivered with lots of goodies chocolates,cookies,candies and snacks. Free Toronto hand delivery. 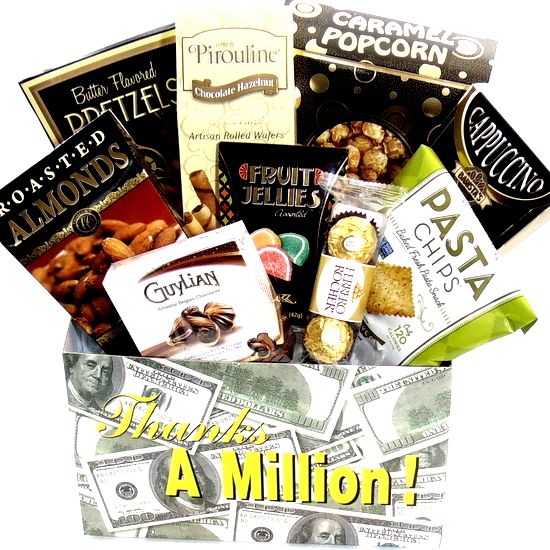 Send your Thanks message with this Thank You gourmet gift basket. Thanks gourmet gift is a great way to express your appreciation to anyone. 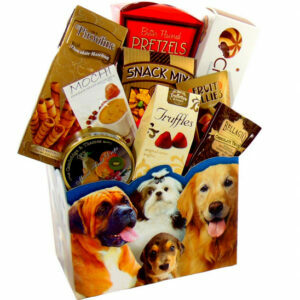 Send gourmet food gift basket to Coworkers. Client, Friend, Mom, Dad, Manager, Teacher, Nurse, Doctor, Dog walker, Caregiver and anyone that you want to send Thank you message. Thanks gourmet gift. Thanks A Million! Gift Box printed words on $100 dollars bills open gift box. Free Toronto hand delivery to recipient’s home and office. Thank you gourmet food Gift Basket. White open gift box with green $100 dollars bills. 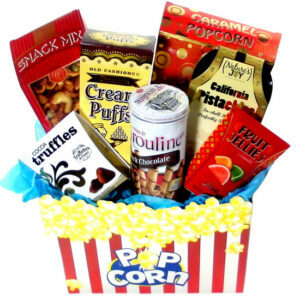 Caramel popcorn, Pretzels, Chocolate hazelnut cookies, Cappuccino drink mix, Pasta gourmet Chips, Fruit jelly candies, Roasted almond, Box of chocolates Seasheall, Hazelnut chocolates.